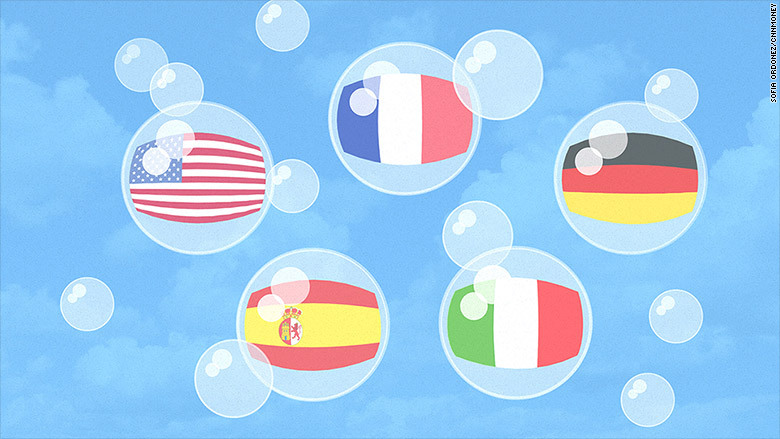 Is the bond bubble in U.S. and Europe finally bursting? Bond yields have soared in the U.S.. Germany, France, Spain and Italy. Is the bond bubble finally bursting? So much for bonds being safe. Investors have fled U.S. and European bonds over the past few days. Is this the end of a great rally for bonds ... the bursting of a bubble? It's too soon to say. But the yield on the 10-Year U.S. Treasury was around 1.92% at the beginning of last week. It's now at about 2.21%. Rates go up as investors sell. That might not sound like a huge move, but it is massive in the often sleepy world of fixed income. And it will mean big losses for anyone that has money in bonds -- which many average investors do. As bad as it's been in the U.S., Europe is worse. German bund yields have gone from 0.16% to around 0.65% since the start of last week. The yield on French bonds went from 0.4% to nearly 1%. Spanish and Italian bond yields shot up from around 1.3% to just under 2%. Of course, rates are still relatively low by historical standards. 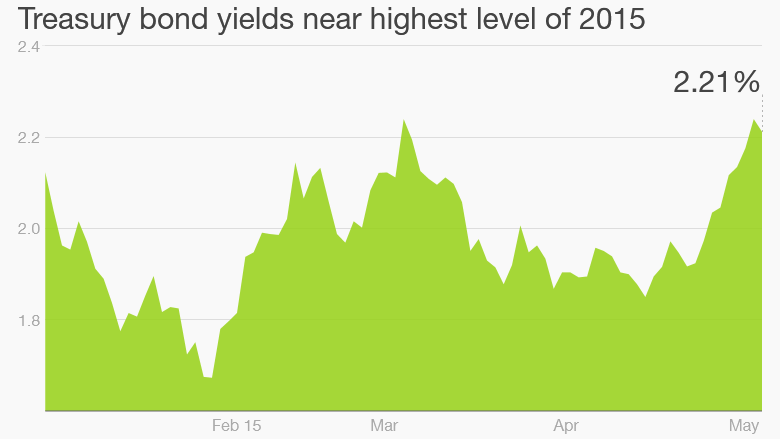 But these yields are now near their highest levels of the year. The trend is what is spooking the market -- and how fast it's changing. What it means: According to a report from Bloomberg, the value of the worldwide bond market has plunged more than $430 billion since yields began to soar last week. What the heck is going on? At first glance, it doesn't make sense. The European Central Bank is now buying bonds, a policy dubbed "quantitative easing," in an attempt to keep rates low. While the Federal Reserve stopped its own QE program last year and is expected to raise interest rates later this year, most investors think the rate hike will be small. But experts said that diminishing concerns about deflation in Europe have pulled bond yields from their lows. Consumer prices were flat last month, following four months of falling prices. One reason investors had been buying bonds -- and in some cases even accepting negative yields -- was the fear that asset prices would keep falling. In that scary scenario, small losses were viewed as tolerable. So it's only natural for European bond yields to start rising again. They simply couldn't go down much more. "Central banks have held yields down for such a long time," said Tom Clarke, a manager of the William Blair Macro Allocation Fund in London. There also is evidence that the eurozone economy is getting better. The ECB actions might actually be helping. Leah Bennett, co-chief investment officer of investment firm South Texas Money Management, noted that bank lending to small businesses increased in the first quarter. And she pointed out that exports in Europe, particularly Germany, have surged thanks to how weak the euro has gotten this year. With that in mind, bond yields should go up. That's what they usually do when an economy is gaining strength. Deflation worries ebbing: Now why has this lifted yields in the U.S. as well? Developed market bond yields often move in tandem, said Ashraf Laidi, chief global strategist at City Index in London. The U.S. and Europe are typically lumped in together as safe havens for investors. The rebound in oil prices is also helping push bond yields higher, Laidi added. Crude recently shot above $60 a barrel and is now near its highest levels of the year. "This is all about a reduction in global deflation fears," Laidi said. That's great news for the global economy. But it could mean a lot more pain for bond investors if yields shoot higher. Mike O'Rourke, chief market strategist with JonesTrading, wrote in a recent note that there is still "asset price distortion" in the market. So a move in bonds could be as "seismic" as what happened to oil last year and early this year. "The moves have the potential to be violent," he wrote. But William Blair's Clarke isn't so sure rates will shoot that much higher. Bond yields usually spike when people are worried about inflation. There's a big difference between deflation worries ending and actual inflation coming. "There is no huge risk in a sudden rise in inflation expectations," he said. "Inflation is still the dog that didn't bark."